In the dappled shade of my Woodland Garden, Sweet Woodruff, pictured above, makes the perfect foil for the bed of Japanese painted ferns. I have also seen it used to good effect in my friend Randy’s garden; there, great sweeps of it flourish along pathways in quite deep shade. The soft, star-like whorls of pale green foliage invite touching, especially when the tips are lit from May through June with tiny, tubular white flowers. As for culture, simply amend the soil with copious quantities of leaf mold to begin with, insure moisture with deep summer soakings and what do you get? Well, two things: a groundcover that keeps its handsome looks from spring emergence to winter departure (it is semi-evergreen), and the essential ingredient for a refreshing brew called May Wine. May Wine is nothing more than a white wine punch infused with Sweet Woodruff. I can tell you the concoction has distinct German credentials. It is part of the tradition of the maypole, an annual ritual that brought together the unmarried women and men of a village. Both the flowers on the maypole and the fresh herbs in the wine honored youth and springtime. Now, you might be surprised that Gallium can flavor anything, for freshly picked it offers neither taste nor scent. But when permitted to steep in a crisp Riesling for several hours, something magical happens. The wine becomes intensely aromatic, with hints of honey, vanilla, and herbs. Pour a half bottle of white wine (preferably a Riesling) into a carafe or jar. Add five sprigs of fresh Sweet Woodruff. Cover, and let the two mingle in the refrigerator for about 10 hours. To serve, strain into goblets, float a fresh strawberry atop each glass, and enjoy, knowing that you are perpetuating an ancient — and definitely pagan — fertility rite. 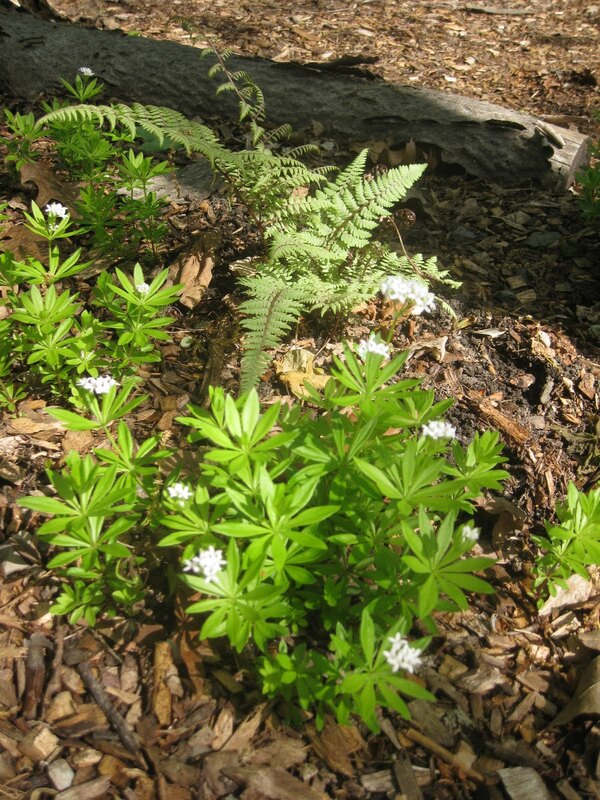 And that’s Sweet Woodruff for you, a plant that makes a speedy, graceful carpet of green in the garden, and a flavorful wine for a springtime gathering. The maypole, of course, is optional. I love sweet woodruff, but I don't care for May wine. Too sweet for my taste! 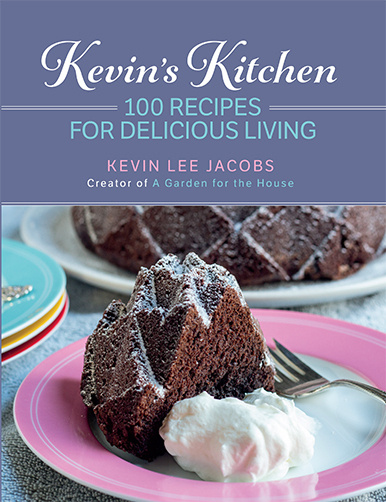 Kevin, thanks for the recipe. I once had May wine at a Bavarian restaurant, only the wine was was combined with champagne. As I recall, it was sparkling and delicious! I do not have any woodruff in my garden right now, but I aim to correct this as soon as possible. 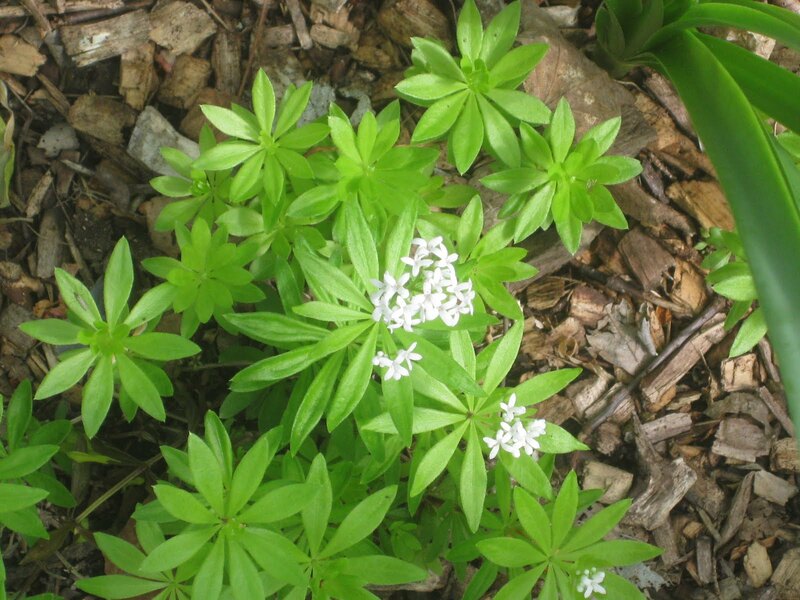 Your Sweet Woodruff looks beautiful, but have you found it to be aggressive at all? I once planted goutweed as a groundcover, and although it was lovely, it took over. I'm still trying to rip it out. I agree that Sweet Woodruff is a beautiful ground cover for semi-shaded areas. The texture of the foliage en-mass is quite beautiful and graceful and I like the lighter green of the foliage which contrasts nicely with the darker foliage of many ferns and other woodland plants and the Woodruff also stays low enough that it does not swamp out many other plants. To me it is a must have when I design gardens for customers who have a shady spot. I tend to plant plugs of the Woodruff which fill in quickly without becoming a nuisance (like the Goutweed, which unfortunately does have the most beautiful variegated foliage of cream and soft green). And of course I do always use a bit of the Sweet Woodruff to make May wine at this time of year. I find it a nice seasonal treat, though I do use a slightly drier wine than what is strictly traditional. Adele – I have not found woodruff to be a bully, unlike the goutweed you mentioned. 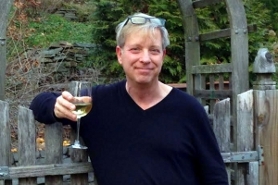 Randy – do post your recipe for May wine when you get the chance. As I recall, you let yours steep not for a day, but a week. Kevin, do you think the wine could be made with pinot grigio or sauvignon blanc? I absolutely hate sweet wine, including riesling. Justin – I'm curious about this too. Perhaps one of us can give it a try. May wine: Bottle of chardonnay. Cut sweet wodruff stems with leaves about 2 inches long. Try to cut BEFORE it flowers. Do not use the blossoms in the drink. Put stem with leaves in bottle for about 3 hours to get the flavor. Drink it all as it will not keep. Anne – is this your mother's recipe? Kevin, I don’t see my ground cover in your pictures. It has small blue flowers in spring and spreads with tendrils. It will grow and spread quickly especially in a shady area where I can’t get anything else to grow, not even grass. I don’t know the name of it , do you have any idea? I love your web site.